Presenting an eye catching display of elegant flatware in an array of two tone splendor that is both sophisticated and pragmatic. Choose from an array of handle colors. The sleek crystal clear & color combination will coordinate with your table setting scheme and produce that special ambiance. Clear Disposable Plastic Forks with Cream Handle 20ct. Clear Disposable Plastic Spoons with Cream Handle 20ct. Clear Disposable Plastic Knives with Cream Handle 20ct. 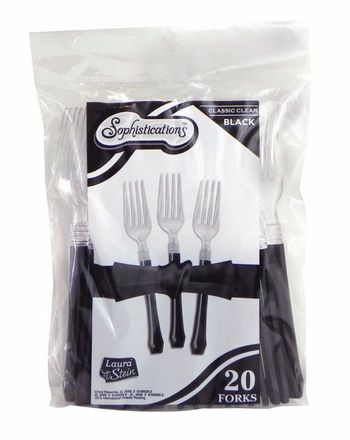 Clear Disposable Plastic Forks with Black Handle 20ct. Clear Disposable Plastic Spoons with Black Handle 20ct. Clear Disposable Plastic Knives with Black Handle 20ct. Clear Disposable Plastic Forks with White Handle 20ct. Clear Disposable Plastic Spoons with White Handle 20ct. Clear Disposable Plastic Knives with White Handle 20ct. Clear Disposable Plastic Spoons, Forks, Knives with Black Handle Combo Cutlery 24ct. Clear Disposable Plastic Spoons, Forks, Knives with White Handle Combo Cutlery 24ct. Clear Disposable Plastic Spoons, Forks, Knives with Cream Handle Combo Cutlery 24ct.